In need of any last-minute Halloween decorations? I was, so I made this Halloween bat flock, and put together this little tablescape. These guys are hanging from the chandelier above our dining room table, and I quite like the effect. If you have better climbing abilities than I do, though, these would look great hanging from a ceiling. Just affix them with a bit of tape (heavy-duty tape if we’re talking outdoors), or tie the string in place. See that bloody candle? Here’s the easy tutorial for how to make your own blood-drip candle. Fancy your own flock? I’ve got instructions for how to make your own, including a template. 1. 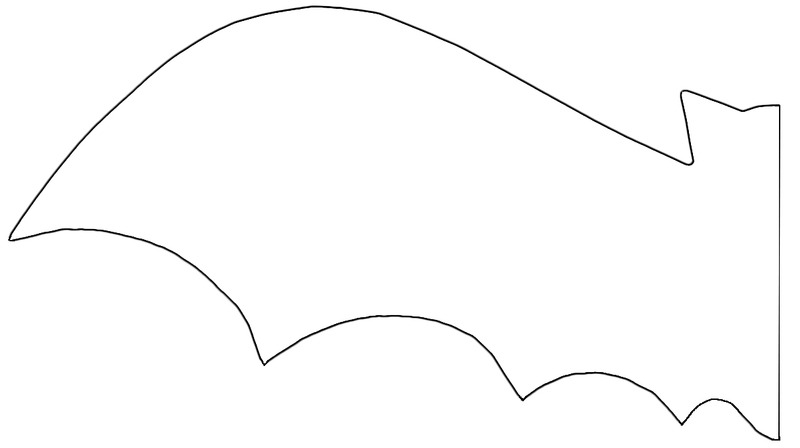 Print out the bat template and cut it out. 2. Fold a piece of black construction paper in half, short sides together. Place the straight edge of the bat template along the folded edge of the paper, and trace around the template. You should be able to fit 3 bats on a standard size piece of paper. 3. Cut the bat shape out of the folded paper, and unfold. 5. Remove the needle, tie a knot in the thread, and trim off the excess. Use the remaining thread to hang the bat, either tying it or affixing it with tape. So stinkin’ cute! Hope you had a great Halloween!